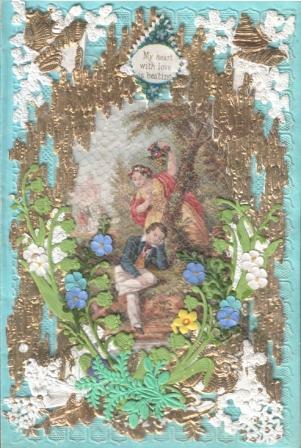 Prints by George Baxter and his Licensees can often be found on Victorian Valentine Cards. Those printed by Joseph Mansell, like the one above, are the most common. Not surprising as his firm also produced embossed fancy Valentine cards and sometimes used their own Baxter Process Prints as embellishments. Individuals also used Mansell's prints to decorate Valentine Cards creating their own unique cards using various elements of their choice. The card shown here carries the print with the attributed name "The Dreamer" printed by Joseph Mansell around 1855. The print is covered by a fine netting with paper flowers and foliage added. The sentiment is "My heart with love is beating."